I was once a member of the Charlie Chuckles Club. It was a children’s club run by the Sunday Telegraph years ago. I still have my club badge! It’s a little silver laughing kookaburra. Club members were called “Chucklers”. Apart from the regular things like illness, death, falling out of the sky in a burning plane, sinking to the bottom of the ocean when your cruise ship is hit by an iceberg, being kidnapped by terrorists etc etc etc I am afraid of being cold and being hungry. Clear and easy to read, but harder to understand. Succinct. Funny. Ambiguous. Metaphorical. Wondering. The Cat in the Hat. So energetic! I would like to go back to the 1860s, so I could go and hear Charles Dickens reading his own work aloud on one of his reading tours. This is the ONLY thing I would want to go back in time for. Can I have something to read and something to eat? Simply learning that there was such a thing as a writer, when I was about six. I knew I loved books, so I thought, that’s what I would like to do. Egg. I like very short words that hold a lot of meaning! Ursula is the author of numerous fiction titles for children and young adults. 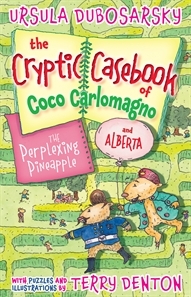 Her most recent release is the very entertaining The Perplexing Pineapple, the first book in the new The Cryptic Casebook of Coco Carlomagno and Alberta series, published by Allen & Unwin and available now in all good bookstores. You can find out more about Ursula and her work by visiting her website. I love the fact that Charles Dickens is the only thing you'd go back for. So worth it.